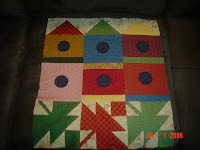 I finished the Safe House quilt block for our Thimbleberries Club. We each volunteered to make a block out of Thimbleberries fabrics from our "stash". We will be donating this quilt to Faith's Lodge in Wisconsin -- a retreat center for parents who have lost a child or whose child is gravely ill. This block was fun and easy to make. I am a little inspired to make the whole quilt now!